An offsite meeting venue – leave the “baggage” in the office! Build relationships and reward your team or customers – finish with a team event, with the emphasis on building relationships, breaking down barriers, through competitive, yet fun, racing! 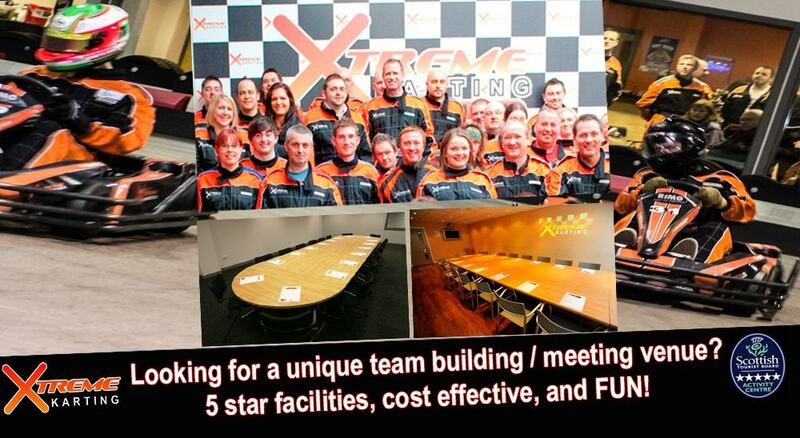 Xtreme Karting offer an alternative, yet cost effective option to the usual offsite venues, with 5 star facilities providing the ideal venue for meetings or presentations, complimented by an adrenaline packed, fun event to finish the day off. Options include: Meeting room from 10am to 5pm, Team Endurance or GP style event, Free tea/coffee, catering options available at additional cost. Available Mon-Thurs only. Feedback from previous corporate groups has been fantastic, but don’t take our word for it, call us now on 0131 333 0195 and we’ll be glad to show you round!